Our Lady appeared to St. Simon Stock, a Carmelite and handed him a brown woolen scapular, in the year 1251, in the town of Aylesford in England. By simply wearing the Scapular, we can tell to Our Lady, every moment of the day that we venerate her, love her and trust in her protection. When we use the scapular as a prayer, Our Lady draws us to the Sacred Heart of Her Divine Son. It is good, therefore, to hold the scapular in the hand. A prayer offered while holding the Scapular is as perfect as a prayer can be. 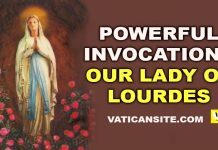 It is especially in time of temptation that we need the powerful intercession of God’s Mother. The evil spirit is utterly powerless when the wearer of a scapular faces temptation, calling upon the Holy Virgin in this silent devotion. In order to obtain the graces and promises recieved from wearing the Scapular, one should wear it devoutly. In other words, under the usual conditions, i.e. state of grace (Go to Confession regularly!! 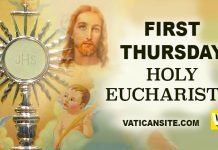 ), be properly invested/enrolled by a Catholic priest, pray either the Little Office of the Blessed Virgin Mary or 5 decades of the Most Holy Rosary daily. Novenas to Our Lady of Mt. Carmel are optional but highly recommended to show the Mater Dei that we Her most lowly and undeserving servants have faith in Her most powerful protection and intercession. 1- In May 1957, in Westenboden, Germany, an entire row of houses had caught fire. The inhabitants of one of the houses fixed a scapular to the front door of their home. Five hours later, 22 homes on the block had burnt to the ground. Yet amidst the destruction, the home with the scapular attached to it stood unharmed. This miracle was witnessed by hundreds of people. 2- Three holy men devoted to the scapular, Pope Bl. Gregory X, St. Alphonsus Liguori, and St. John Bosco, all died wearing the scapular. When their graves were opened years later, the bodies and vestments had decayed but their scapulars remained perfectly intact. 3- In November of 1955, a plane carrying 27 passengers crashed in Guatemala. All the passengers died except for one young girl. She related that when the plane was going down, she clutched her scapular and cried out to Our Lady for help. She was burnt and her clothes were tattered and burnt as well, but the girl was overall unharmed and her scapular free from any burns. O my God, in union with the Immaculate Heart of Mary, I offer Thee the Precious Blood of Jesus from all the altars throughout the world, joining with It the offering of my every thought, word and action of this day. as a shield of defence against the Evil One. Just want to share about wearing the brown scapular and I believed it’s a miracle that happened to me during my kidnapping experienced. A brown scapular. When I’m with the kidnappers they told me to remove my scapular to burn and one old lady their relatives , said no don’t do that because it’s not good you keep it. 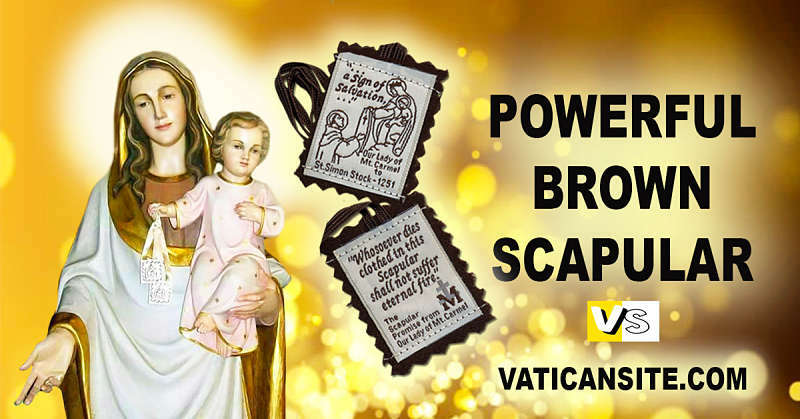 By wearing a brown scapular. The day I scapped with my kidnappers it’s also the feast of our lady of Fatima” May 11, 1986. What an awesome miracle, Erwin Bartolome! St. John Bosco was an incorruptible saint. 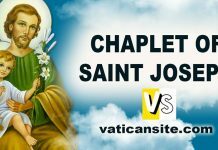 Please correct the statement about his body being corrupt, but not his scapular. St. John Bosco’s body did corrupt. His bones are encased in a wax figure of him dressed in traditional priestly vestments with a glass cover over it which has travelled the world to different dioceses. Many people believe that his body is incorrupt when they see the wax figure but it is not. I saw it when it came to our local cathedral in Florida about 6 years ago. His Brown Scapular, however, is incorrupt and is in a reliquary.